In October, NAR's Pending Home Sales Index barely edged forward with a 0.1 percent month-over-month increase. This month, the PHSI declined 2.5 percent to 107.3 from 110.3 in October. 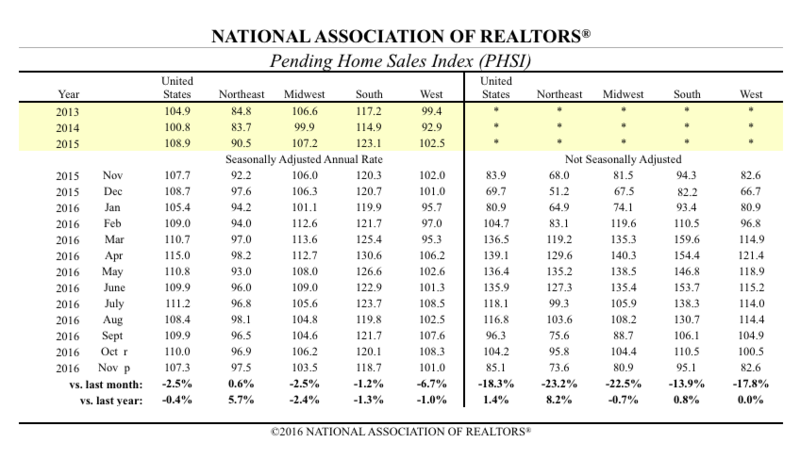 The National Association of Realtors’ Pending Home Sales Index (PHSI) has been on a rollercoaster — it’s gone from a record low in August to a stupendous September, and then to a slow-moving October. Now, the PHSI has taken a downward track due to an increase in mortgage rates and continuing supply woes. “The budget of many prospective buyers last month was dealt an abrupt hit by the quick ascension of rates immediately after the election,” said NAR Chief Economist Lawrence Yun in a statement. November’s PHSI slipped to 107.3 — a 2.5 percent decrease from October’s 110.0. The PHSI in the Northeast increased to 97.5 and is 5.7 percent above a year ago. In the Midwest, the index declined to 103.5, and is now 2.4 percent lower than November 2015. Pending home sales in the South declined to an index of 118.7 — a 1.2 percent month-over-month and 1.3 percent year-over-year increase. The West suffered the biggest loss with an index of 101.0 — a 6.7 percent month-over-month and 1.0 percent year-over-year decrease. Yun says the health of the 2017 housing market will continue to be dependent on borrowing costs and consistent job growth. “Healthy local job markets amidst tight supply means many areas will remain competitive with prices on the rise. Those rushing to lock in a rate before they advance even higher will probably have few listings to choose from,” said Yun.